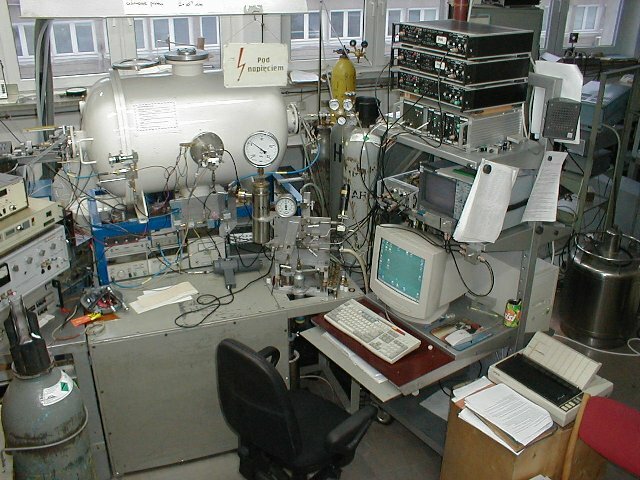 This laboratory is called ON2.3 - Millimetre and Submillimetre Spectroscopy. Our main research activity is rotational spectroscopy of small molecules and intermolecular complexes at frequencies from 2 to ca 500 GHz. Our research is mainly concerned with recording and analysis of pure rotational spectra of molecules and of weakly bound intermolecular complexes. These studies are carried out in the gas-phase and the spectra arise from quantised end-over-end rotation of molecules. Analysis of rotational spectra allows highly precise determination of the geometry, of the electric dipole moment, and of inter- and intra-molecular interactions in the studied species. An important feature of the derived molecular information is that it is for isolated molecules and has traditionally provided a benchmark for ab initio quantum chemistry calculations. Their aim has been to determine new molecular information as well as spectroscopic constants for use in environmental (i.e. atmospheric and astrophysical) applications. The goal of these studies is to improve the understanding of the nature of the intermolecular interaction. They allow precise determination of the geometry, dipole moment, nuclear quadrupole splitting constants, and of the effect of the shape of the intermolecular potential on the measured spectroscopic observables. The spectrometer is based on Istok-type high-frequency Backward Wave Oscillators. The sources are phase locked, in two PLL loops, to a 3 GHz synthesiser. Measurements are made in transmission using source modulation, second derivative detection, and GaAs or InSb detectors. The preferred operating range is 150-350 GHz, although the available coverage is from <100 to >500 GHz. The picture shows the free-space optics of the higher frequency PLL loop, which locks the source to a K-band harmonic. 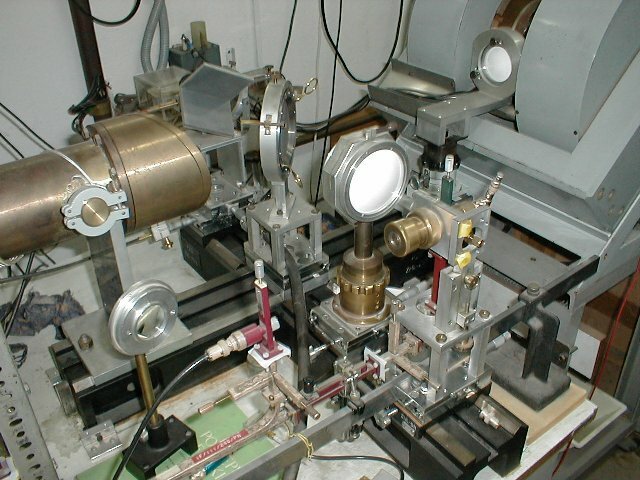 This spectrometer allows recording of sub-Doppler spectra of supersonically cooled samples. The operating range is 2-18.5 GHz and electrodes for Stark measurements are available. It is possible to measure spectra in standard supersonic expansion through a standard circular pulsed nozzle, with a heated nozzle, and with a nozzle equipped with electric discharge. The white high-vacuum cavity contains a confocal Fabry-Perot microwave resonator with 50 cm diameter mirrors. The processing and interpretation of spectroscopic data is often a computationally intensive task and the availability of suitable programs is crucial to the efficiency of such studies. For this reason we maintain a database of computer programs dealing with various aspects of the rotational spectroscopy problem. The PROSPE database contains extensively tested, well documented programs written both in this laboratory and elsewhere. Beata Agnieszka Pietrewicz: "Spektroskopia rotacyjna wybranych cząsteczek i kompleksów międzyczasteczkowych w naddźwiękowej wiązce molekularnej", IFPAN, 2003. Oleksandr Desyatnyk: "Wyznaczanie struktur i momentów dipolowych cząsteczek metodą spektroskopii rotacyjnej", IFPAN, 2005. Orest Dorosh: "Szerokopasmowa spektroskopia rotacyjna cząsteczek zawierających plaszczyznę symetrii", IFPAN, 2008. Adam Krasnicki: "Rotational spectroscopy of selected molecules of astrophysical inportance", IFPAN, 2011. Zbigniew Kisiel: "An investigation of the microwave spectra of R2O...HX type hydrogen bonded dimers in the gas phase", University College London, 1980. Z.Kisiel, E.Bialkowska-Jaworska, L.Pszczolkowski, A.Milet, C.Struniewicz, R.Moszynski, and J.Sadlej, "Structure and properties of the weakly bound trimer (H2O)2...HCl observed by rotational spectroscopy", J.Chem.Phys. 112, 5767-5776 (2000). Z.Kisiel, J.Kosarzewski, B.A.Pietrewicz, and L.Pszczolkowski, "Electric dipole moments of the cyclic trimers (H2O)2...HCl and (H2O)2...HBr from Stark effects in their rotational spectra", Chem.Phys.Lett. 325, 523-530 (2000). Z.Kisiel, B.A.Pietrewicz, O.Desyatnyk, L.Pszczolkowski, I.Struniewicz, and J.Sadlej, "Structure and properties of the weakly bound cyclic trimer (H2O)2...HBr observed by rotational spectroscopy", J.Chem.Phys. 119, 5907-5917 (2003). Z.Kisiel, B.A.Pietrewicz, P.W.Fowler, A.C.Legon, and E.Steiner, "Rotational spectra of the less common isotopomers, electric dipole moment and the double minimum inversion potential of H2O...HCl", J.Phys.Chem.A 104, 6970-6978 (2000). see also: Z.Kisiel, "Least-squares mass-dependence molecular structures for selected weakly-bound intermolecular complexes", J.Mol.Spectrosc. 218, 58-67 (2003). H2O...(HCl)2: Z.Kisiel, A.Lesarri, J.L.Neill, M.T.Muckle, and B.H.Pate, "Structure and properties of the (HCl)2H2O cluster observed by chirped-pulse Fourier transform microwave spectroscopy", Phys.Chem.Chem.Phys. 13, 13912-13919 (2011). C. Perez, D. P. Zaleski, N. A. Seifert, B. Temelso, G. C. Shields, Z. Kisiel, B. H. Pate, ”Hydrogen bond cooperativity and the three-dimensional structures of water nonamers and decamers”, Angew. Chem. Int. Ed. 53, 14368-14372 (2015). C. Perez, S. Lobsiger, N. A. Seifert, D. P. Zaleski, B. Temelso, G. C. Shields, Z. Kisiel, B. H. Pate, ”Broadband Fourier transform rotational spectroscopy for structure determination: The water heptamer”, Chem. Phys. Lett. 571, 1-15 (2013). C. Perez, M. T. Muckle, D. P. Zaleski, N. A. Seifert, B. Temelso, G. C. Shields, Z. Kisiel, B. H. Pate, ”Structures of the Cage, Prism, and Book Isomers of Water Hexamer from Broadband Rotational Spectroscopy”, Science 336, 897-901 (2012). Ar...HCl: Z.Kisiel and L.Pszczolkowski, "Rotational spectrum and spectroscopic constants of 36Ar...H35Cl and 40Ar...HCl", Chem.Phys.Lett. 291,190-196 (1998). Arn...HX, n=2,3, X=F, Cl, Br: Z.Kisiel, E.Bialkowska-Jaworska, and L.Pszczolkowski, "The experimental electric dipole moments of the ArnHX van der Waals clusters", Chem.Phys.Lett. 333,381-386 (2001). Pyrimidine...H2O: S.Melandri, M.E.Sanz, W.Caminati, P.G.Favero, and Z.Kisiel, "The hydrogen bond between water and aromatic bases of biological interest: an experimental and theoretical study of the 1:1 complex of pyrimidine with water", J.Amer.Chem.Soc. 120, 11504-11509 (1998). N2...HCl: Z.Kisiel and L.Pszczolkowski, P.W.Fowler, and A.C.Legon, "Rotational spectrum of 14N2...H35Cl and 14N2...H37Cl: electric field gradients at the nitrogen nuclei", Chem.Phys.Lett. 276, 202-209 (1997). N2...HBr: Z.Kisiel, B.A.Pietrewicz, and L.Pszczolkowski, "Rotational spectrum of the most abundant isotopomer of the van der Waals dimer N2...HBr", Acta Physica Polonica A. 101, 231-242 (2002). Z.Kisiel, B.A.Pietrewicz, and L.Pszczolkowski, "The observation and characterisation by rotational spectroscopy of the weakly bound trimer Ar2HBr", J.Chem.Phys. 117, 8248-8255 (2002). Z.Kisiel, E.Bialkowska-Jaworska, and L.Pszczolkowski, Chem.Phys.Lett. 333,381-386 (2001) - dipole moment measurement only. Ar...HCCCN: O.Desyatnyk, J.Kosarzewski, Z.Kisiel, "Observation and properties of the van der Waals dimer Ar...HCCCN produced in electrical discharge", Acta Physica Polonica A 104, 415-424 (2003). Freons: A Rotational Study of CH2F2...CH2Cl2”, Chem. Asian J. 9, 1032-1038 (2014). Z.Kisiel, E.Bialkowska-Jaworska, and L.Pszczolkowski, "Nuclear quadrupole coupling in Cl2C=CHCl and Cl2C=CH2; "Evidence for systematic differences in orientation between internuclear and field gradient axes for terminal quadrupolar nuclei", J.Chem.Phys. 109, 10263-10272 (1998). Z.Kisiel and L.Pszczolkowski, "Assignment and analysis of the mm-wave rotational spectrum of trichloroethylene: observation of a new, extended b.R-band and an overview of high-J, R-type bands", J.Mol.Spectrosc. 177, 125-137 (1996). Z.Kisiel, L.Pszczolkowski, G.Cazzoli, L.Dore, "Strong Coriolis coupling between v5 and v11 states of CH3CCl3 studied by millimeter-wave spectroscopy", J.Mol.Spectrosc. 251, 235-240 (2008). L.Dore and Z.Kisiel, "Nuclear quadrupole coupling in 1,1,1-Trichloroethane: Inertial and principal tensors for 35Cl and 37Cl", J.Mol.Spectrosc. 189, 228-234 (1998). Z.Kisiel and L.Pszczolkowski, "Millimeter wave rotational spectra of the 37Cl species of 1,1,1,-trichloroethane" J.Mol.Spectrosc. 181, 48-55 (1997). G.Cazzoli, G.Cotti, L.Dore, and Z.Kisiel, "The high frequency rotational spectrum of 1,1,1-trichloroethane and the observation of K=3 splitting", J.Mol.Spectrosc. 174, 425-432 (1995). Z.Kisiel, E.Bialkowska-Jaworska, and L.Pszczolkowski, "Nuclear quadrupole coupling in Cl2C=CHCl and Cl2C=CH2; Evidence for systematic differences in orientation between internuclear and field gradient axes for terminal quadrupolar nuclei", J.Chem.Phys. 109, 10263-10272 (1998). Z.Kisiel, J.L.Alonso, S.Blanco, G.Cazzoli, J.M.Colmont, G.Cotti, G.Graner, J.C.Lopez, I.Merke, and L.Pszczolkowski, "Spectroscopic constants for HCFC-22 from rotational and high-resolution vibration spectra: CHF237Cl and 13CHF235Cl isotopomers", J.Mol.Spectrosc. 184, 150-155 (1997). Z.Kisiel, L.Pszczolkowski, G.Cazzoli, and G.Cotti, "The millimeter-wave rotational spectrum and Coriolis interaction in the two lowest excited vibrational states of CHClF2", J.Mol.Spectrosc. 173, 477-487 (1995). G.Klatt, G.Graner, S.Klee, G.Mellau, Z.Kisiel, L.Pszczolkowski, J.L.Alonso, and J.C.Lopez, "Analysis of the high-resolution FT-IR and millimeter-wave spectra of the v5=1 state of CHF2Cl", J.Mol.Spectrosc. 178, 108-112 (1996). Z.Kisiel, E.Bialkowska-Jaworska, L.Pszczolkowski, "The <ICI bending satellites in the millimeter-wave rotational spectra of CH2I2 and CD2I2", J.Mol.Spectrosc. 199, 5-12 (2000). Z.Kisiel, L.Pszczolkowski, L.B.Favero, and W.Caminati, "An isotopomer of the first molecule containing two iodine nuclei investigated by microwave spectroscopy", J.Mol.Spectrosc. 189, 283-290 (1998). Z.Kisiel, L.Pszczolkowski, W.Caminati, and P.G.Favero, "First assignment of the rotational spectrum of a molecule containing two iodine nuclei: spectroscopic constants and structure of CH2I2", J.Chem.Phys. 105, 1778-1785 (1996). Z.Kisiel, A.Krasnicki, L.Pszczolkowski, S.T.Shipman, L.Alvarez-Valtierra, B.H.Pate, "Assignment and analysis of the rotational spectrum of bromoform enabled by broadband FTMW spectroscopy", J.Mol.Spectrosc. 257, 177-186 (2009). Z.Kisiel, L.Pszczolkowski, I.R.Medvedev, M.Winnewisser, F.C.De Lucia, E.Herbst, "Rotational spectrum of trans-trans diethyl ether in the ground and three excited vibrational states", J.Mol.Spectrosc. 233, 231-243 (2005). I.Medvedev, M.Winnewisser, F.C.De Lucia, E.Herbst, E.Bialkowska-Jaworska, L.Pszczolkowski, Z.Kisiel, "The millimeter- and submillimeter-wave spectrum of the trans-gauche conformer of diethyl ether", J.Mol.Spectrosc. 228, 314-328 (2004). I.Medvedev, M.Winnewisser, F.C.De Lucia, E.Herbst, E.Yi, L.P.Leong, R.P.A.Bettens, E.Bialkowska-Jaworska, O.Desyatnyk, L.Pszczolkowski, Z.Kisiel, "The millimeter- and submillimeter-wave spectrum of the trans-trans conformer of diethyl ether C2H5OC2H5", Astrophys.J.Suppl.Series 148, 593-597 (2003). Z.Kisiel, E.Bialkowska-Jaworska, R.A.H.Butler, D.T.Petkie, P.Helminger, I.R.Medvedev, F.C.De Lucia, "The rotational spectrum of chlorine nitrate (ClONO2) in four lowest nv9 polyads", J.Mol.Spectrosc. 254, 78-86 (2009). R.A.H.Butler, D.T.Petkie, P.Helminger, F.C.De Lucia, E.Bialkowska-Jaworska, Z.Kisiel, "The rotational spectrum of chlorine nitrate (ClONO2): The v6 vibrational state", J.Mol.Spectrosc. 244, 113-116 (2007). R.A.H.Butler, D.T.Petkie, P.Helminger, F.C.De Lucia, Z.Kisiel, "The rotational spectrum of chlorine nitrate (ClONO2): The v5/v6v9 dyad", J.Mol.Spectrosc. 243, 1-9 (2007). Acrylonitrile = Vinyl cyanide, H2C=CHCN: This molecule has been classified as a significant astrophysical weed molecule and thus requiring detailed understanding of its rotational spectrum well into the THz region. The A&A paper showed that even its rotational transitions in relatively high vibrational states are astrophysically relevant. Z. Kisiel, M.-A. Martin-Drumel, O. Pirali, ”Lowest vibrational states of acrylonitrile from microwave and synchrotron radiation spectra”, J. Mol. Spectrosc. 315, 83-91 (2015). A. Lopez, B. Tercero, Z. Kisiel, A. M. Daly, C. Bermdez, H. Calcutt, N. Marcelino, S. Viti, B. J. Drouin, I. R. Medvedev, C. F. Neese, L. Pszcz´ o lkowski, J. L. Alonso, J. Cernicharo, ”Laboratory characterization and astrophysical detection of vibrationally excited states of vinyl cyanide in Orion-KL”, Astron. Astrophys. 572, A44:1-39 (2014). Z. Kisiel, L. Pszczolkowski, B. J. Drouin, C. S. Brauer, S. Yu, J. C. Pearson, I. R.Medvedev, S. Fortman, C. Neese, ”Broadband rotational spectroscopy of acrylonitrile: Vibrational energies from perturbations”, J. Mol. Spectrosc. 280, 134-144 (2012). A. Krasnicki, Z. Kisiel, B. J. Drouin, J. C. Pearson, ”Terahertz spectroscopy of isotopic acrylonitrile”, J. Mol. Struct. 1006, 20-27 (2011). A. Krasnicki, Z. Kisiel, ”Electric dipole moments of acrylonitrile and of propionitrile measured in supersonic expansion”, J. Mol. Spectrosc. 270, 83-87 (2011). Z.Kisiel, L.Pszczolkowski, B.J.Drouin, C.S.Brauer, S.Yu, J.C.Pearson, "The rotational spectrum of acrylonitrile up to 1.67 THz", J.Mol.Spectrosc. 258, 26-34 (2009). G.Cazzoli, Z.Kisiel, "The rotational spectrum of acrylonitrile in excited states of the low frequency CCN bending vibrational modes", J.Mol.Spectrosc. 130, 303-315 (1988). M.A. Cordiner, M.Y. Palmer, C.A. Nixon, P.G.J. Irwin, N.A. Teanby, S.B. Charnley, M.J. Mumma, Z.Kisiel, J. Serigano, Y.-J. Kuan, Y.-L. Chuang, K.-S. Wang, ”Ethyl cyanide on Titan: Spectroscopic detection and mapping using ALMA”, Astrophys. J. Lett. 800, L14:1-7 (2015). Z.Kisiel, O.Dorosh, A.Maeda, I.R.Medvedev, F.C.De Lucia, E.Herbst, B.J.Drouin, J.C.Pearson, S.T.Shipman, "Determination of precise relative energies of conformers of n-propanol by rotational spectroscopy", Phys.Chem.Chem.Phys. 12, 8329-8339 (2010). Z.Kisiel, L.Pszczolkowski, J.C.Lopez, J.L.Alonso, A.Maris, and W.Caminati, "Investigation of the rotational spectrum of pyrimidine from 3 to 337 GHz: Molecular structure, nuclear quadrupole coupling, and vibrational satellites", J.Mol.Spectrosc. 195,332-339(1999). Y-J.Kuan, C-H.Yan, S.B.Charnley, Z.Kisiel, P.Ehrenfreund, H-C.Huang, "A search for interstellar pyrimidine", Mon.Not.R.Astron.Soc. 345,650-656(2003). Z.Peeters, O.Botta, S.B.Charnley, Z.Kisiel, Y.-J.Kuan, P.Ehrenfreund, "Formation and photostability of N-heterocycles in space - I. The effect of nitrogen on the photostability of small aromatic molecules", Astron. & Astrophys. 433, 583-590 (2005). Toluene: V.V.Ilyushin, Z.Kisiel, L.Pszczolkowski, H.Mader, J.T.Hougen, "A new torsion-rotation fitting program for molecules with a sixfold barrier: Application to the microwave spectrum of toluene", J.Mol.Spectrosc. 259, 26-38 (2010). Z.Kisiel, E.Bialkowska-Jaworska, L.Pszczolkowski, H.Mader, "Ground state rotational spectrum of toluene", J.Mol.Spectrosc. 227, 109-113 (2004). Fluorobenzene: Z.Kisiel, E.Bialkowska-Jaworska, L.Pszczolkowski, "The millimeter-wave rotational spectrum of fluorobenzene", J.Mol.Spectrosc. 232, 47-54 (2005). Chlorobenzene, Bromobenzene, Iodobenzene: O.Dorosh, E.Bialkowska-Jaworska, Z.Kisiel, L.Pszczolkowski, "New measurements and global analysis of rotational spectra of Cl-, Br- , and I-benzene: Spectroscopic constants and electric dipole moments", J.Mol.Spectrosc. 246, 228-232 (2007). Anisole and Benzaldehyde: O.Desyatnyk, L.Pszczolkowski, S.Thorwirth, T.M.Krygowski, Z.Kisiel, "The rotational spectra, electric dipole moments and molecular structures of anisole and benzaldehyde", Phys.Chem.Chem.Phys. 7, 1708-1715 (2005); publisher's correction Phys.Chem.Chem.Phys. 7, 2080 (2005). Phenylacetylene: Z.Kisiel, A.Krasnicki, "The millimetre-wave rotational spectrum of phenylacetylene", J.Mol.Spectrosc. 262, 82-88 (2010). Z. Kisiel, M. Winnewisser, B. P. Winnewisser, F. C. De Lucia, D. W. Tokaryk, B. E. Billinghurst, ”Far-Infrared Spectrum of S(CN)2 Measured with Synchrotron Radiation: Global Analysis of the Available High-Resolution Spectroscopic Data”, J. Phys. Chem. A 117, 13815-13824 (2013). Z.Kisiel, O.Dorosh, M.Winnewisser, M.Behnke, I.R.Medvedev, F.C.De Lucia, "Comprehensive analysis of the FASSST rotational spectrum of S(CN)2", J.Mol.Spectrosc. 246, 39-56 (2007). H2C=CClCN: Z.Kisiel and L.Pszczolkowski, "Nuclear quadrupole coupling in 2-chloroacrylonitrile: inertial and principal quadrupole tensor components for Cl and N", J.Mol.Spectrosc. 184, 215-220 (1997). CH2Cl2: Z.Kisiel, J.Kosarzewski, and L.Pszczolkowski, "Nuclear quadrupole coupling tensor of CH2Cl2: Comparison of quadrupolar and structural angles in methylene halides", Acta Physica Polonica A. 92, 507-516 (1997). Chloroform, HCCl3: E.Bialkowska-Jaworska, Z.Kisiel and L.Pszczolkowski, "Nuclear quadrupole coupling in chloroform and calibration of ab initio calculations", J.Mol.Spectrosc. 238, 72-78 (2006). CHF2I: C.T.Dewberry, Z.Kisiel, S.A.Cooke, "The pure rotational spectrum of Difluoroiodomethane, CHF2I", J.Mol.Spectrosc. 261, 82-86 (2010). Z.Kisiel, E.Bialkowska-Jaworska, L.Pszczolkowski, "Nuclear quadrupole coupling in Cl2C=CHCl and Cl2C=CH2; Evidence for systematic differences in orientation between internuclear and field gradient axes for terminal quadrupolar nuclei", J.Chem.Phys. 109, 10263-10272 (1998). Z.Kisiel and L.Pszczolkowski, "The high-frequency rotational spectrum of 1,1-dichloroethylene", Z.Naturforsch. 50A, 347-351 (1995). tBuX, X=F, Cl, Br, I, CN, NC: Z.Kisiel, E.Bialkowska-Jaworska, O.Desyatnyk, B.A.Pietrewicz, L.Pszczolkowski, "The gas-phase electric dipole moments of the symmetric top tertiary butyl molecules tBuX, X=F,Cl,Br,I,CN, and NC", J.Mol.Spectrosc. 208, 113-120 (2001). 1-F-adamantane: A.C.Legon, J.Tizard, and Z.Kisiel, "Bridgehead distortion at the C1 position of 1-fluoroadamantane revealed by rotational spectroscopy and ab initio calculations", J.Mol.Struct. 612, 83-91 (2002). O. Pirali, Z. Kisiel, M. Goubet, S. Gruet, M.A. Martin-Drumel, A. Cuisset, F. Hindle, G. Mouret, ”Rotation-vibration interactions in the spectra of polycyclic aromatic hydrocarbons: Quinoline as a test-case species”, J. Chem. Phys. 142, 104310:1-11 (2015). Z.Kisiel, O.Desyatnyk, L.Pszczolkowski, C.B.Charnley, P.Ehrenfreund, "Rotational spectra of quinoline and of isoquinoline: spectroscopic constants and electric dipole moments", J.Mol.Spectrosc. 217, 115-122 (2003). Camphor: Z.Kisiel, O.Desyatnyk, E.Bialkowska-Jaworska, L.Pszczolkowski, "The structure and electric dipole moment of camphor determined by rotational spectroscopy", Phys.Chem.Chem.Phys. 5, 1359-1364 (2003). Urethane (ethyl carbamate): M.Goubet, R.A.Motiyenko, F.Real, L.Margules, T.R.Huet, P.Asselin, P.Soulard, A.Krasnicki, Z.Kisiel, E.A.Alekseev, "Influence of the geometry of a hydrogen bond on conformational stability: a theoretical and experimental study of ethyl carbamate", Phys.Chem.Chem.Phys. 11, 1719-1728 (2009). 1,3-benzodioxole: Z.Kisiel, L.Pszczolkowski, G.Pietraperzia, M.Becucci, W.Caminati, R.Meyer, "The anomeric effect in 1,3-benzodioxole: additional evidence from the rotational, vibration-rotation and rovibronic spectra", Phys.Chem.Chem.Phys. 6, 5469-5475 (2004). Cyclopropyl cyanide: L.Bizzocchi, C.D.Esposti, L.Dore, Z.Kisiel, "Submillimetre-wave spectrum, 14N-hyperfine structure, and dipole moment of cyclopropyl cyanide", J.Mol.Spectrosc. 251, 138-144 (2008). Acetic acid/Acetone: O.Dorosh, Z.Kisiel, "Electric dipole moments of acetone and of acetic acid measured in supersonic expansion", Acta Physica Polonica A. 112, S95-S104 (2007). Glycolic acid: Z.Kisiel, L.Pszczolkowski, E.Bialkowska-Jaworska, S.B.Charnley, "Millimetre wave rotational spectrum of glycolic acid", J.Mol.Spectrosc. 321, 12-32 (2016). Lactic acid: L.Pszczolkowski, E.Bialkowska-Jaworska, Z.Kisiel, "The millimeter-wave rotational spectrum of lactic acid", J.Mol.Spectrosc. 234, 106-112 (2005). Pyruvic acid: Z.Kisiel, L.Pszczolkowski, E.Bialkowska-Jaworska, S.B.Charnley, "The millimeter-wave rotational spectrum of pyruvic acid", J.Mol.Spectrosc. 241, 220-229 (2007). Pyruvonitrile (acetyl cyanide): A.Krasnicki, L.Pszczolkowski, Z.Kisiel, "Analysis of the rotational spectrum of pyruvonitrile up to 324 GHz", J.Mol.Spectrosc. 260, 57-65 (2010). 2,2-dichloropropane, (CH3)2CCl2: E. Bialkowska-Jaworska, L. Pszczolkowski, Z. Kisiel, ”Comprehensive analysis of the rotational spectrum of 2,2-dichloropropane”, J. Mol. Spectrosc. 308-309, 20-27 (2015).